It’s the holiday season and with another year coming to an end, it’s also time for a wide range of religious celebrations to take place. Investing is a lot like religion too. Just like there are a countless number of religions, there are also a countless number of investing styles, whether you are talking about Value investing, Growth, Quantitative, Technical, Momentum, Merger-Arbitrage, GARP (Growth At a Reasonable Price), or a multitude of other derivative types. But regardless of the style followed, most professional managers believe their style is the sole answer to lead followers to financial nirvana. While I may not share the same view (I believe there are many ways to skin the stock market cat), each investing discipline (or religion) will have its own unique core tenets that drive expectations for future returns (outcomes). Profits: Over the long-run there is a very significant correlation between stock prices and profits (see also It’s the Earnings, Stupid). I’m not the only one preaching this religious belief, investment legends Peter Lynch and William O’Neil think the same. In answer to a question by Dell Computer’s CEO Michael Dell about its stock price, Lynch famously responded , “If your earnings are higher in five years, your stock will be higher.” The same idea works with the overall stock market. As I recently wrote (see Why Buy at Record Highs? Ask the Fat Turkey), with corporate profits at all-time record highs, it should come as no surprise that stock prices are near all-time record highs. Regardless of the absolute level of profits, it’s also very important to have a feel for whether earnings are accelerating or decelerating, because investors will pay a different price based on this dynamic. Interest Rates: When embarrassingly low CD interest rates of 0.08% are being offered on $10,000 deposits at Bank of America, do you think stocks look more or less attractive? It’s obviously a rhetorical question, because I can earn 20x more just by collecting the dividends from the S&P 500 index. Now in 1980 when the Federal Funds rate was set at 20.0% and investors could earn 16.0% on CDs, guess what? Stocks were logging their lowest valuation levels in decades (approximately 8x P/E ratio vs 17x today). 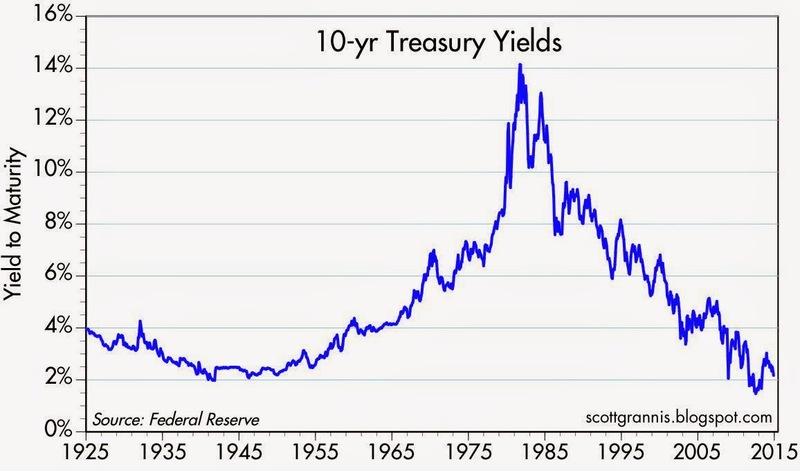 The interest rate chart from Scott Grannis below highlights the near generational low interest rates we are currently experiencing. Sentiment: As I wrote in my Sentiment Indicators: Reading the Tea Leaves article, there are plenty of sentiment indicators (e.g., AAII Surveys, VIX Fear Gauge, Breadth Indicators, NYSE Bulls %, Put-Call Ratio, Volume), which traditionally are good contrarian indicators for the future direction of stock prices. When sentiment is too bullish (optimistic), it is often a good time to sell or trim, and when sentiment is too bearish (pessimistic), it is often good to buy. With that said, in addition to many of these short-term sentiment indicators, I realize that actions speak louder than words, therefore I like to also see the flows of funds into and out of stocks/bonds to gauge sentiment (see also Market Champagne Sits on Ice). Valuations: As Fred Hickey, the lead editor of the High Tech Strategist noted, “Valuations do matter in the stock market, just as good pitching matters in baseball.” The most often quoted valuation metric is the Price/Earnings multiple or PE ratio. In other words, this ratio compares the price you would pay for an annual stream of profits. This can be tricky to determine because there are virtually an infinite number of factors that can impact the numerator and denominator. Currently P/E valuations are near historical averages (see below) – not nearly as cheap as 1980 and not nearly as expensive as 2000. If I only had one metric to choose, this would be a good place to start because the previous three legs of the stool feed into valuation calculations. In addition to P/E, at Sidoxia one of our other favorite metrics is Free-Cash-Flow Yield (annual cash generation after all expenses and expenditures divided by a company’s value). Earnings can be manipulated much easier than cold hard cash in our view. Nobody, myself and Warren Buffett included, can consistently predict what the stock market will do in the short-run. Buffett freely admits it. However, investing is a game of probabilities, and if you use the four tenets of profits, interest rates, sentiment, and valuations to drive your long-term investing decisions, your chances for future financial success will increase dramatically. This framework is just as relevant today as it is when studying the 1929 Crash, the 1989 Japan Bubble, or the 2008-2009 Financial Crisis. If your goal is to not become an investing fool, I highly encourage you to follow the legs of the Sidoxia stool. DISCLOSURE: Sidoxia Capital Management (SCM) and some of its clients own a range of positions, including BAC and certain exchange traded fund positions, but at the time of publishing SCM had no direct position in any other security referenced in this article. No information accessed through the Investing Caffeine (IC) website constitutes investment, financial, legal, tax or other advice nor is to be relied on in making an investment or other decision. Please read disclosure language on IC Contact page. Author: Investing CaffeineInvesting Caffeine, a blog written by professional money manager Wade W. Slome, CFA, CFP®. Investing Caffeine will wake up your investment brain by tackling the complex issues of investing and financial planning, with the goal of educating and entertaining your mind.